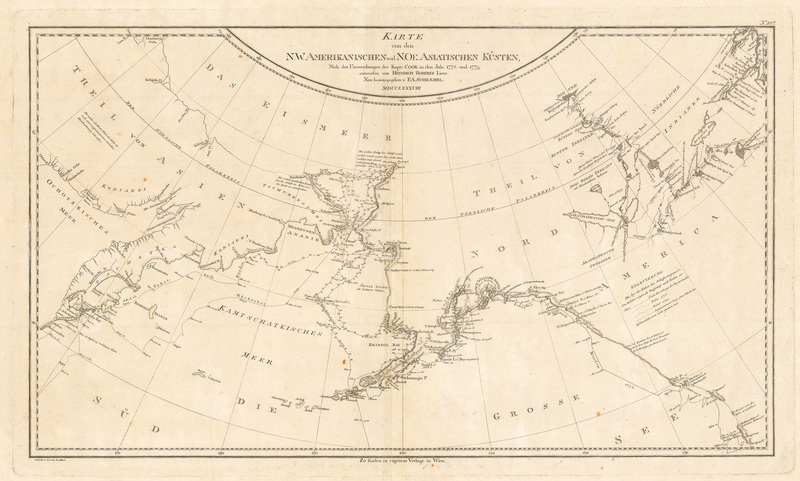 This is an authentic antique map of the northern Pacific focusing on portions on Northeast Asia, the Bering Strait, Alaska, and Northwestern Canada. The map was published by Franz Anton Schraembl out of Vienna in 1788. This is the German variation of Captain Cook’s exploration of the northern Pacific, based on an original work by Henry Roberts (Cook’s Cartographer). Impressive detail is given with regard to the Kamtschaka Peninsula, Bering Sea, the southern coast of Alaska and a large portion of northern Canada extending as far east as the Hudson Bay. Numerous soundings accompany the various track of exploration. The map also notes the explorations of Bodega as well as the inland tracks and discoveries of Hearn. Condition: Map is in B condition, with wide margins, and some minor staining.